A fearsome Death Trooper joins the invasion of planet Scarif. Inspired by the 2016 film Rogue One: A Star Wars Story. Unframed canvas print measures 21 1/4-inches tall x 16-inches wide. Hand-numbered limited edition of only 95 pieces, signed by artist Randy Martinez! 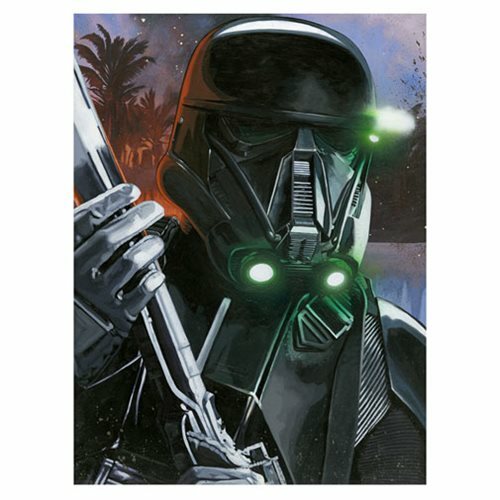 A fearsome Death Trooper in the invasion of tropical planet Scarif is the subject of this ominous Star Wars Rogue One Death Trooper Canvas Giclee Art Print by artist Randy Martinez. Inspired by the 2016 Rogue One: A Star Wars Story movie, Death Trooper: Scarif Invasion is a hand-numbered limited edition of only 95 pieces, each signed by the artist. Unframed, it measures 21 1/4-inches tall x 16-inches wide and comes with a certificate of authenticity.